Need to Find Legit Online Jobs? Here’s How You Can Start! Welcome to Real Ways to Earn! This blog has been here since 2010, helping people find legit online jobs and earn extra money online. It's a big site and there's a ton of information here. So much, in fact, that you might feel a little overwhelmed by it with no idea where to look first. And that's what I hope this page will help you with. When you first land on this site, you'll see the most recent blog posts that have been written. These blog posts contain information on legit online jobs, extra money ideas, general work from home resources and information, and more. Another important feature of this site are the work from home job leads. We try to get these updated four times a week, Monday through Thursday. We spend a few hours each day these are posted, searching the internet for companies that are currently hiring for home-based work. The leads we find are carefully hand-picked and posted here. The companies featured are legit to the best of my knowledge, but often have not been as thoroughly researched as the companies I review on the main blog, so you'll want to use your own good judgment before applying to anything you find. It's not uncommon for work from home jobs to close quickly, so if you're interested in a position, you should apply as soon as you can. If you can't remember to check my job leads page for updates, you may want to consider signing up for my newsletter. If you're subscribed to that, you will receive an email twice a week (usually Tuesday and Thursday) with all the legit online jobs founds for the week along with new blog posts and anything else newsworthy I think you should know about. The other major feature here that you should definitely check out is the work from home directory. This directory is constantly being built on, and it will never really be complete because there are always companies to add and take away. The directory offers a great way to kind of see — at a glance — what your options are when considering legit online jobs. I get a lot of emails from people with specific questions about finding legit online jobs, and lots of times I see the same questions again and again. These questions usually turn into blog posts, and because these posts contain information everyone is curious about, they become our most popular posts. It pays to know where to actually look for jobs online. While I do post leads here as I find good ones, there are hundreds floating around out there that I never see. I recommend checking Indeed regularly, using “remote” in the location field or “work from home” in the keyword field to do your searching. Indeed is basically the Google of jobs (if you didn't already know that). You can get 30 percent off a FlexJobs membership if you use promo code AFFILPROMO. Extra cash is important, too. It comes in handy when you're in pinch or need some “back-up” money to tide you over if something unexpected happens. There are lots of posts about earning extra money on this blog. Here are 11 of the most popular ones. Working for yourself is basically awesome, but it takes a lot of hard work and perseverance to ultimately become your own boss. Unlike working from home for a company or doing little things here and there for extra cash, the money is not immediate. You may have to work for free for a while before you start seeing a return on your efforts. 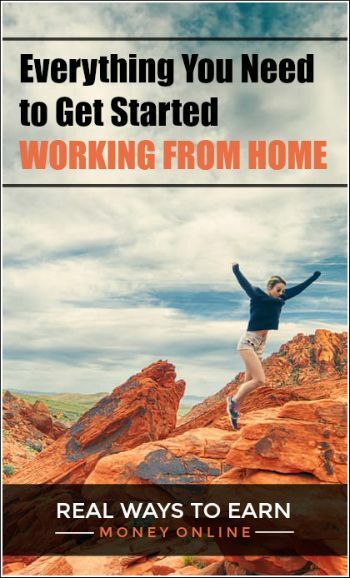 Hopefully by now you know your way around and where to go to find the work from home information you need. If you are still confused, feel free to check our FAQ or you can always contact me and I will help if I can. If you don't want to miss any new legit online jobs, subscribe to my newsletter. You may also want to follow us on social media! Good luck! I hope you enjoy your time browsing this site and that you find the perfect work from home opportunity for you!